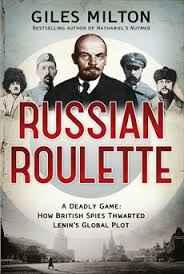 Veteran journalist and author Joseph C. Goulden offers a good review of Giles Milton's Russian Roulette - A Deadly Game: How British Spies Thwarted Lenin's Global Plot in today's Washington Times. To Great Britain, the threat issued by Vladimir Ilyich Ulyanov — better known by his revolutionary name of Lenin — was clarion clear. In November 1917, soon after his Bolshevik faction seized control of Russia, he called on the “oppressed masses” of Asia to follow Russia’s example and throw off colonial rule. He named as an early target India, the “jewel in Britain’s imperial crown.” Lenin declared, “England is our greatest enemy. It is in India that we must strike them hardest!” For emphasis, Lenin tore up the 1907 Anglo-Russian Convention that laid out spheres of influence in Central Asia, specifically protecting India’s northern frontiers from Russian intrusion. ... As Mr. Milton documents, the British intelligence service flooded Moscow with swarms of agents soon after the Bolsheviks seized power. The tasks were many. Could the Bolsheviks be overthrown and replaced by the ousted Kerensky government? Did the new government have the political will (and military capability) of continuing the fight against Germany? The story of British machinations in Moscow has been related by both operatives and histories, ranging from Sidney (“The Ace of Spies”) Reilly to Somerset Maugham. Through skilled use of recently declassified files of Indian political intelligence, Mr. Milton gives a gripping account of how the Reds tried to carry out Lenin's threat.